The tree in the lobby is lit and so is the Christmas fireplace! 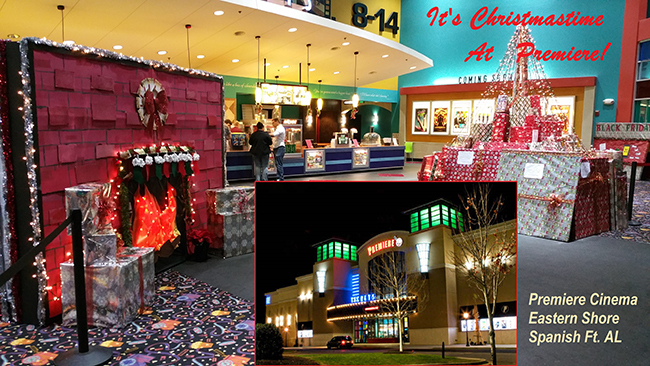 Presents abound and holiday movies are arriving daily at Premiere Cinema in Eastern Shore, AL says Director Dan Lundquist. And Premiere GIFT CARDS are on sale NOW! "We love getting together with staff during the holidays to decorate our lobby for the season, whether its Halloween, Valentines or Christmas, we always come up with something new," said Mr. Lundquist. "Our regular guests who come here often always get a kick out of seeing what new things we've come up with." Mr. Lundquist has been in the business of managing, marketing and theming movie theatres for two decades now, having utilized his talents and creativity at several other theatre companies before taking over the reins at Premiere. He has been recognized nationally for his work in advertising and showmanship, and people around southern Alabama have taken notice. "The Premiere at Eastern Shore Centre is one of those you just know is always going ot have something fun and exciting going on," said Jim Levison, Premiere's Director of Food Ops on a recent visit to the location. "Every time I'm there I see something new and Dan's staff is always the most friendly and enjoyable to be around." Mr. Levinson recently installed new pizza ovens in the concession kitchen, as Mr. Lundquist and his staff now offer up delicious mouth-watering fresh-baked gourmet pizzas to movie-goers now in addition to all the other great food and concession offerings.